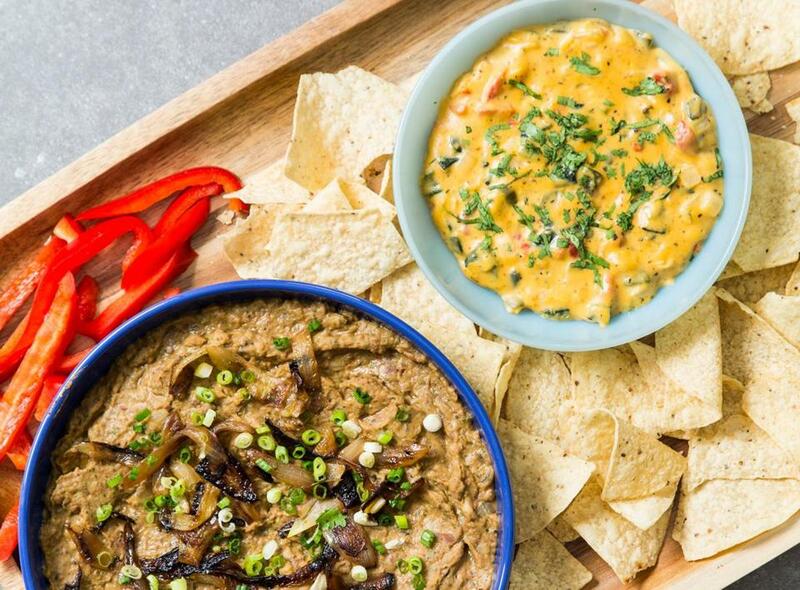 Pinto bean dip with charred onion and chipotle, left, and chile con queso, Tex-Mex style. Unequivocally, undeniably, and with no ifs, ands, or buts, watching the Super Bowl on TV requires snacks. Period. While the possibilities are endless, here are three that should hit the spot: crisp, crunchy, tangy Chex party mix to throw back by the handful; a smooth, savory, slightly spicy cheese dip; and a hearty, healthy-ish bean dip with charred onions. With the rack in the middle position, heat the oven to 300 degrees. Line a large rimmed baking sheet with parchment and set aside. In a small saucepan over medium heat, melt the butter. Add the brown sugar, chili powder, ground oregano, smoked paprika, garlic powder, and 1 teaspoon ground black pepper and cook, whisking to combine, until the brown sugar is dissolved and the mixture is uniform, about 1½ minutes. In a very large bowl, gently toss the cereal, smoked almonds, pretzels, Melba toast, and butter mixture to coat the solids evenly. Add the barbecue sauce and 1½ tablespoons water to the saucepan (no need to clean it first), return it to medium heat, and cook, stirring, until the barbecue sauce is warm and fluid, about 2 minutes. Add it to the cereal mixture and gently toss to coat the solids evenly. Spread the mixture evenly on the prepared baking sheet. Bake until lightly browned and crisp, about 35 minutes, stirring well every 10 minutes and sprinkling with 1½ teaspoons salt before the last stirring. 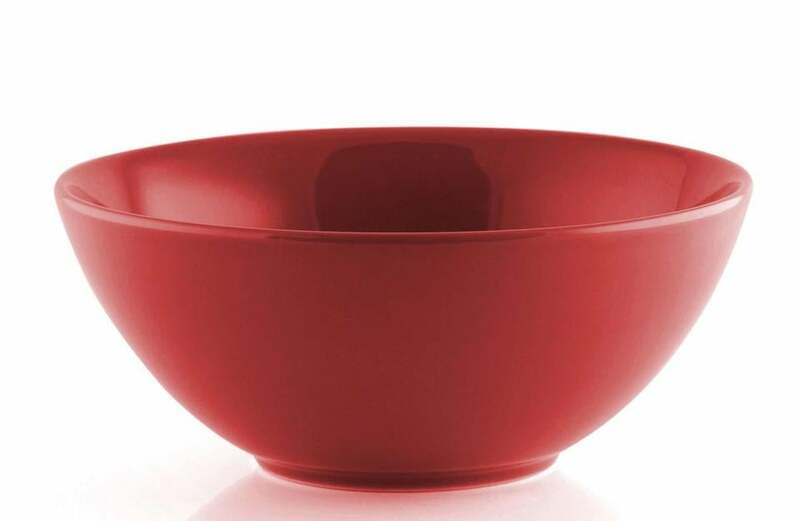 Cool the mix to room temperature and serve, or store in an airtight container at room temperature for up to 1 week. Break out the largest bowl you have to toss the Chex mixture before it bakes. The extra space makes tossing easier. Velveeta, which is typical in Tex-Mex-style chile con queso, is largely responsible for its smooth texture. Ro-Tel, a canned mixture of diced tomatoes and green chilies, is another common ingredient, but in my view it doesn’t match the flavor of freshly charred poblano peppers — they’re worth the extra effort. In a medium nonstick saucepan over medium heat, heat the oil until shimmering. Add the onion and ¼ teaspoon salt and cook, stirring, until softened, about 4 minutes. Add the garlic, oregano, cayenne, and cumin and cook, stirring, until fragrant, about 40 seconds longer. Add the half-and-half, tomatoes, poblanos, and ground black pepper to taste and bring to a simmer, stirring, about 2 minutes. Adjust heat to low and add the cheeses, including the Velveeta, about ½ cup at a time, stirring constantly (but gently) and making sure that each addition is fully melted and incorporated before adding the next, about 6 minutes longer. Adjust the seasoning with salt and ground black pepper, if necessary. Sprinkle with cilantro and serve at once with chips. Strips of fresh red bell pepper — and tortilla chips, of course — are my chosen dippers. In a large, heavy nonstick or cast-iron skillet over medium-high heat, heat 2 teaspoons of the oil until shimmering. Add about half the onion slices in a single layer and cook, undisturbed, until charred on the bottom, about 4 minutes. Flip them and continue to cook, again undisturbed, until the second side is charred, about 3 to 4 minutes longer. Remove onions, add another 2 teaspoons oil, heat it for a moment, and repeat to char remaining onion slices. Cool onions briefly and remove and reserve a few small inner rings for garnish; roughly chop the rest of the onions and set aside. Add the remaining oil, garlic, and cumin to the skillet, return it to low heat, and cook, stirring constantly, until just sizzling and fragrant, about 30 seconds. Add ‚ cup hot water, scrape the bottom of the pan to loosen any stuck bits, and set aside off heat to cool. Add the lime juice and stir to mix. In a food processor, puree all of the beans except the reserved ½ cup, chipotle, cilantro, ½ teaspoon salt, and ground black pepper to taste for about 30 seconds; scrape the sides of the bowl with a flexible spatula. With the feed tube open and the motor running, add the liquid mixture in a slow, steady stream; continue to process for 1 full minute, stopping to scrape the sides of the bowl if necessary. Add the charred onions and reserved beans and pulse about 3 times to combine (do not overprocess — you want to leave noticeable pieces of both). Scrape the mixture into a bowl, cover, and let stand at room temperature for flavors to develop, about 30 minutes. Adjust the seasoning with salt and ground black pepper, and the consistency with a little extra water, adding it about 1 tablespoon at a time and stirring to incorporate it, if necessary. Sprinkle with the reserved charred onion rings and scallions and serve.